For the next week or so, the center of the cinematic world will be moving to the city of Austin, Texas. The annual South by Southwest Film Festival is starting up, and in addition to being a venue where independent movies and up-and-coming filmmakers can start getting attention for their work, it’s also an event that studios love taking big upcoming projects to and debuting. This year is certainly no different. Many of these big titles will be playing the opening weekend of the big event, but what exactly should you be keeping your eye out for? In order to help answer that question, we’ve thrown together a quick guide highlighting some of the big movies of SXSW, when they are playing, and why we are so excited to see them. Check it out! Though it isn’t scheduled to hit theaters until the middle of summer (July 17th to be exact), and hasn’t actually been finished just yet, director Judd Apatow’s Trainwreck will be getting its world premiere at SXSW on Sunday night. The movie is an interesting change-up for the filmmaker at the helm, as it is his first time directing from a script that he didn’t write. Instead, the script is actually written by comedienne Amy Schumer – who will also be playing her first lead role in a film – though the fact that Apatow has a notorious love of improvisation suggests that we can still expect to hear his voice come through loud and clear. It’s not only exciting that Amy Schumer is going to start being a big screen presence, but Trainwreck also features a fantastic ensemble that should guarantee laughs throughout the movie. Saturday Night Live alum Bill Hader will be starring opposite Schumer as the film’s key love interest, but the rest of the eclectic line-up is packed with the likes of Tilda Swinton, Ezra Miller, Brie Larson, Mike Birbiglia, Dave Attell, Method Man, John Cena, and LeBron James as himself. Given that both Will Ferrell and Kevin Hart are both established as two of the most reliable comedic leads currently working in Hollywood, it shouldn’t be too surprising that we’re anticipating Get Hard as much as we are, as surely we can rely on the dynamic between the two men being worth a great number of laughs. It definitely doesn’t hurt that they are working with a rather ridiculous over-the-top premise that sees Ferrell’s character – a millionaire on his way to federal prison – hiring one of his car washers (Hart) to prepare him for the clink. Attendees of SXSW will be able to get their first look at Get Hard on Monday evening, but the good news is that the film is only a few weeks from release, set to hit theaters on March 27th. The folks at Warner Bros. are almost certainly crossing their fingers hoping that the movie can get a good dose of positive buzz out of its premiere that will lead to big success when the movie arrives in theaters nationwide. 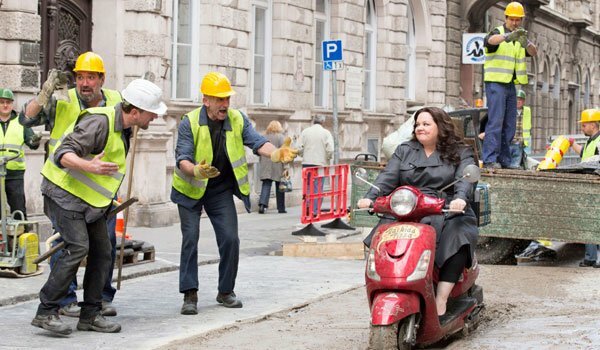 While making Bridesmaids a few years back, director Paul Feig seemingly discovered his muse in the form of Melissa McCarthy. The actress’ performance in the 2011 comedy not only earned the actress a Best Supporting Actress Academy Award nomination, but Feig has also cast her in every project he’s been working on since. This includes the upcoming Ghostbusters reboot, but before we jump ahead to next year, in 2015 we are getting the Feig-McCarthy collaboration Spy, and it will be making its world premiere at this year’s SXSW Film Festival. As you may be able to tell, there is a lot of high-profile comedy at the Austin-based festival competing for audiences’ attention, but Spy - debuting on Sunday - looks to have the goods to steal some of it. Following the tremendous success of Kingsman: The Secret Service, it’s clear that folks are ready to fully embrace laughs that are partnered with James Bond-style action, and with a mix of both dramatic and comedic stars - including McCarthy, Jason Statham, Rose Byrne, Jude Law, Morena Baccarin, Allison Janney and Bobby Cannavale – the upcoming blockbuster looks to deliver. By the end of 2015, we expect that both Oscar Isaac and Domhnall Gleeson will be two of the most buzzed-about actors in the movie world – but it won’t just be because of their work on J.J. Abrams’ Star Wars: The Force Awakens. That’s because their first time on screen together will be featured in writer/director Alex Garland’s Ex Machina - a new sci-fi thriller that looks like it has plans to totally bend audiences’ minds and make everyone question what is real and what isn’t. The lucky folks in Europe have already had the chance to experience Ex-Machina (it currently sits with a 94% Rotten Tomatoes score), but the film will be making its North American premiere at SXSW on Saturday. The story of a young man (Gleeson) who is roped into a Turing Test with an eccentric billionaire (Isaac) and an artificially intelligent android (Alicia Vikander), the movie looks equally thrilling and fascinating, and is certainly one of our most anticipated titles of the festival.